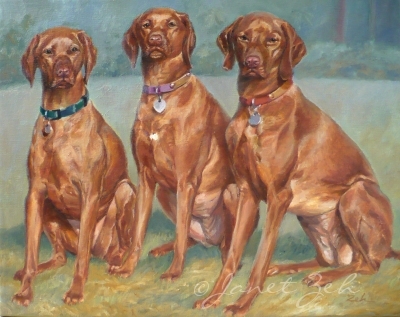 Vizslas are beautiful Hungarian pointing dogs with rusty coats and trim, strong bodies. With their easy-going personalities, they make wonderful pets especially if they have a place to run and stretch their long legs. 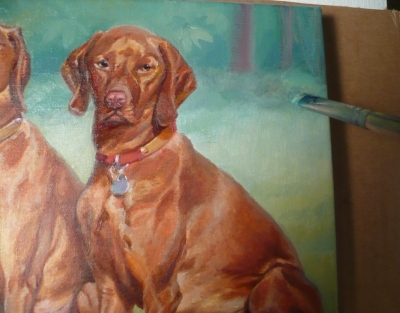 I was asked to do an 8x10 pet portrait on canvas of three female Vizslas sitting together in their yard. Since the photo that was provided had them spaced apart, I decided to move them closer together to make a better composition. 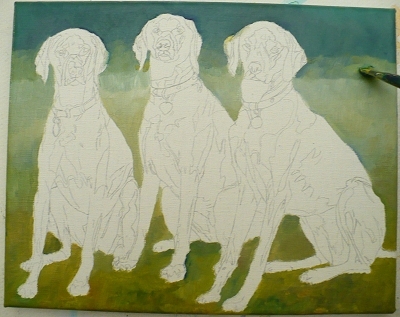 Next, I begin with the dog that is furthest to the left since I am right-handed. This is Wilhelmina. 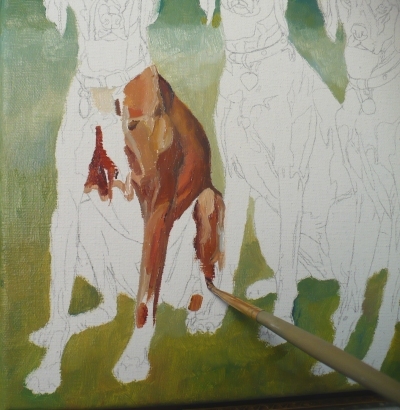 I block in her colors roughly at first with burnt sienna, yellow ochre, ultramarine blue, cadmium red and white. Once Christiana is done, it's time to paint Anastasia. I enjoy painting her because she is sitting sideways so we can see her gorgeous coat. Look at those long legs! 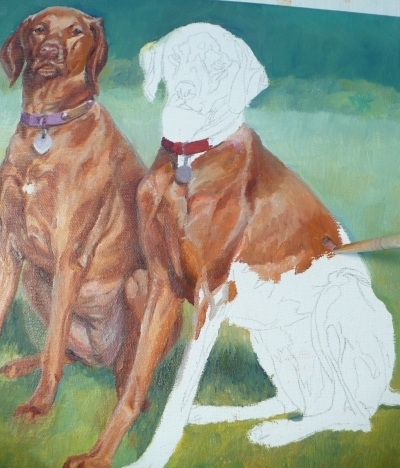 For the background, I add soft impressions of trees and rhododendron, blurring the outlines and keeping it pale since the dogs are darker. This helps the dogs to show up better and keeps the focus on them. 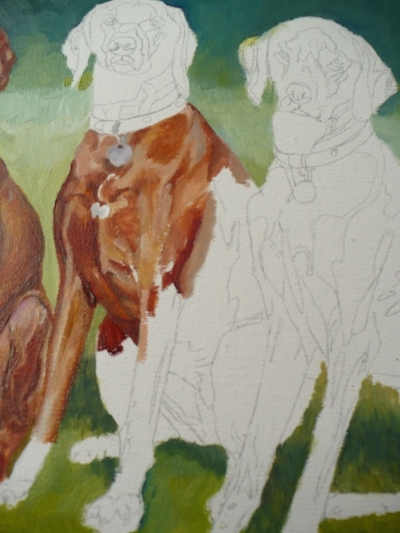 Then I tweak the light and dark areas on the dogs as needed smoothing any rough areas. I also tone down the green background because the client wants a more muted color. Once the oil paints are dry, it will be ready to ship. 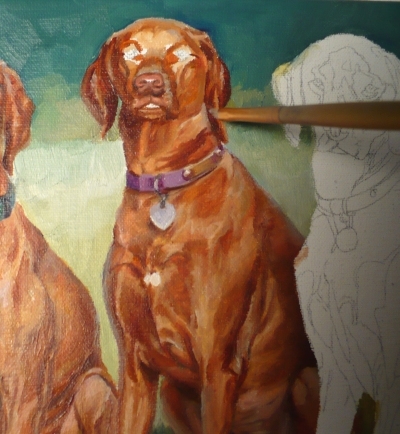 This portrait took a long time to do but finally "Three Vizslas" oil painting is finished! What do you think? Aren't they beautiful girls? 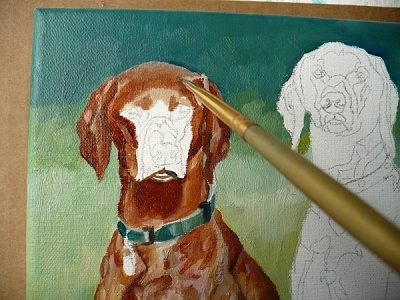 Do you have beloved pets you'd like painted? 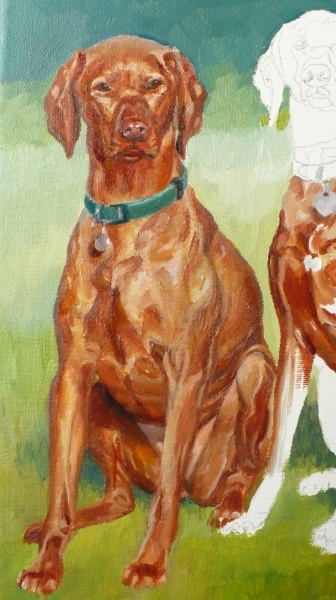 Check out the details here, ZehPetPortraits.com or contact me.